Thyroid neck pain describes discomfort related to some abnormal condition that is affecting the thyroid gland in the anterior neck anatomy. The thyroid is an endocrine gland that is located in the throat, wrapped around the larynx and trachea. Its primary purpose is to produce crucial hormones for the body that help to regulate metabolism. There are many problematic conditions that can impair the thyroid from proper functionality. Only some of these conditions will be painful to any noticeable degree. The rest might be symptomatic, but do not cause neck pain, per se. This exploratory essay focuses on thyroid conditions that involve the possibility of neck pain being included among the symptom set. 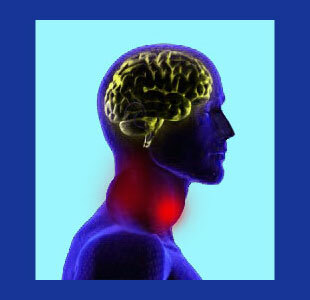 We will examine thyroid pain in the gland itself and in surrounding areas of the neck, as well. Hyperthyroid disease is a condition that involves abnormal escalation of thyroid activity. In these cases, the thyroid gland produces too many hormones. There are many possible sources of hyperthyroidism, including Graves’ disease, thyroid nodule formation, thyroiditis and excessive intake of iodine in the diet. Non-painful symptoms of hyperthyroid conditions might encompass moodiness, nervousness, general fatigue, muscle weakness, insomnia, tremors in the hands, irregular heart-rate, loose stools, weight loss and sensitivity to heat. Meanwhile, hypothyroidism involves a reduction in the hormone-producing activity of the gland. Typical causations include Hashimoto’s disease, thyroiditis, congenital disposition of the gland, injury to the thyroid and chemical reactions due to some pharmaceutical compounds. Non-painful expressions of hypothyroid disorders may include puffy face, tiredness, weight gain, sensitivity to cold, inability to void bowels, lack of saliva or sweat, irregular menstruation, slow heart beat, dry skin and depression. Both hyper and hypothyroidism can cause localized pain in the gland itself and around the surrounding anatomy, especially when a goiter is present. Hypothyroidism is more likely to create systemic pain in joints and soft tissues outside of the immediate gland location. Subacute granulamatous thyroiditis, de Quervain’s thyroiditis, subacute nonsuppurative thyroiditis and painful subacute thyroiditis all describe virtually identical diagnoses that involve viral infection of the gland, typically accompanied by fever and a feeling of having a blocked throat. Acute infectious thyroiditis is caused by bacterial infection of the gland and often involves abscess formation that can become truly problematic to gland functionality. Thyroid concerns are rarely mistaken for other types of neck pain, since they typically involve highly specific symptoms and can be easily diagnosed through rudimentary blood testing and clinical examination. Additionally, pain in association with thyroid problems is rarely severe and is focused on the frontal region of the neck, directly in or around the gland itself. The exceptions include thyroid cancer, which may cause widespread pain in many areas of lymphatic activity throughout the body, and hypothyroidism-related systemic muscle and joint pain. Genetic patterns for thyroid disease drastically increases risk for personal development. Some people are genetically predisposed towards certain types of thyroid problems. Left handed and ambidextrous people demonstrate higher susceptibility to thyroid troubles. People who receive too much or too little iodine are likely to develop some form of thyroid condition. Women are more susceptible than men to all forms of thyroid issues. Pregnancy and postpartum conditions both increase the risk for thyroid abnormalities to exist. Being past middle age increases the risk of thyroid disorders. Smoking and large amounts of emotional stress both increase the risk of thyroid problems slightly. To learn more about thyroid gland pain, or to explain any neck pain complaint, please consult with a qualified physician for diagnostic evaluation.